I have tried many times to install the last version of CCleaner pro. Each time I have the message attached. This warning is usually accompanied by ccleaner still running. Make sure ccleaner is fully exited including smart clean monitoring. Check task manager for ccleaner.exe or ccleaner64.exe. Kill those instances then manully delete the file c:\program files\ccleaner\ccleaner.exe (or the file listed in the error message). Finally click retry(recommencer in the screen shot). 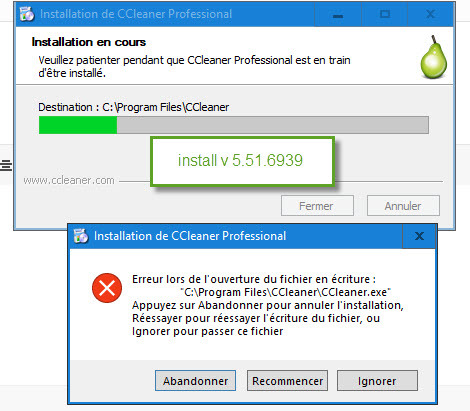 I have tried the solution, and when I try to delete CCleaner64.exe with administrators rights i get this message "file in use, cannot close"
You are showing both CCleaner.exe (32-bit) and CCleaner64.exe (64-bit) there. (You can't see the '.exe' part because of your settings). That is normal, the installer puts both there. Your desktop icon/shortcut will/may point to the 32-bit .exe but it's not a problem, when it starts it will recognise you have a 64-bit system and launch the 64-bit .exe instead. (If you want to then you could change what the shortcut points to by right clicking on the desktop icon and selecting 'Properties'). I deleted CCleaner Pro because it wouldn't install properly. Now I have tried CCtrialSetup and that won't install either. I have the latest version of Windows 10. 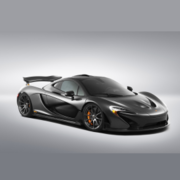 Do you have norton 360 for your antivirus?